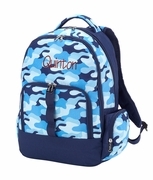 Easy carry, light weight, cinch backpack with a stylish woods pattern. Perfect for hiking, day trips or campus. Washable and water resistant fabric. Approximate size 16"H x 14"W.
This bag is so cute and very well made; the beige embroidery looks great against the camo pattern. My boyfriend's daughter is going to love it! Thanks!